What a pleasure to welcome Desert Sleuths Chapter of Sisters in Crime back to Velma Teague. Nine of the authors whose work appears in the mystery anthology, How NOT to Survive a Vacation, appeared at the library to discuss and sign the book. These authors are members of the only Arizona Chapter of Sisters in Crime, an organization that promotes the work of women mystery writers, although the group also has male members. Roni Olson (R.K. Olson) is the President of Desert Sleuths, and she moderated the panel, introducing each author, while giving a little background about their story. She began by introducing Howard "Doc" Carron, whose story, "The Old Miner"
takes readers on a trip to an Arizona mining town, a trip back in time. Howard said this is two stories in one. It started as an exercise for a writing group, and it just laid there. Then, when he heard that the new anthology's theme dealt with vacations, he used that exercise, and built his story around the original one. So, it's two stories in one. Roni mentioned that Howard is a librarian at the Queen Creek Library. He said they've been so busy lately, that at his medium-sized library, they had 10,000 books on hold last month. Roni pointed out that Howard is an example of a Brother in Crime. When it was mentioned that he was sitting on the end, by himself, she responded there still is a glass ceiling, so they put him there. Lori Hines and Deborah Ledford were the next authors to discuss their contributions. Hines' story is "Tragedy in the Pines." She said she's always been attracted to the paranormal genre, and an incident she had in Sedona provided the material for her story. She was a paranormal investigator for a few years, and that's how her story came about. Deb Ledford's story, "Loose End," takes place in North Carolina. Ledford is also the author of the thriller, Staccato. Deb said she writes in a variety of genres. Most of her stories are thrillers or literary short stories. When she writes crime fiction, she sees the stories visually. She saw a mesh-covered bag of stones for this one, and that's how her stories come about. It started as a story with a male lead, and she switched it to a female. Before discussing the background of her own story, Roni introduced Diana Manley, author of "Checkmate." Manley's story is set in Hawaii, and it features a bored trophy wife. It's a May/December romance. Diana said she was visiting her son in Hawaii, and they were walking a winding path, with large rocks below. She commented that you could kill someone here easily. So, when the theme was picked for the book, it was natural for her to think of Hawaii. The young trophy wife knows her husband's family lives long lives, and she decides she can't put up with her husband any longer. Her mistake? She doesn't realize her husband knows a lot more than she does. Roni said mystery writers can find good places to kill someone anyplace they go. Her story, "A Real Hula-Dunit," is also set in Hawaii. Olson said her stories are usually more character-driven, but in this one, the setting took over. She had been in this place in Maui just before her divorce, a perfect place for murder. "Wish You Weren't Here" is by Chantelle Aimee Osman. It's set in Santa Monica, California when a fan is killed at a mystery authors' conference. Osman said the story was originally supposed to be set in Costa Rica. She had gone on vacation with friends, and had jewelry stolen from her room. She was going to use that scenario. But, a bunch of the Desert Sleuths went to Left Coast Crime last year, a mystery conference, and all of that stuff about the mystery conference just came pouring out in this story. Situations just came to her, and Chantelle had never written funny stories before. Nancy Redd said before she discussed the setting of her story, she just wanted to mention that it sounded as if being an ex-husband was dangerous. Redd found the setting very important for "The Haunted Hogan." Landscape is always important to her, so much so, that it's almost a character. This story, with the Lake Powell and Navajo reservation settings is based on her own experience. She lived there for thirty years, and ran a trading post on the reservation. The man she murdered in the story was one they had been in business with, and in some ways, he deserved to die. Judy Starbuck's "Cowgirls Don't Cry" is set in Prescott. Judy said she likes to write landscapes she knows nothing about. The world of the cowgirl was unfamiliar to her, and she found it intriguing. So, she researched the wisdom and quotes of cowgirls. She found all sorts of interesting quotes, and mentioned a couple. One fit her Annie O'Dell character, "Full of sass, strong as a bull, and proud as a peacock." While trying to give a name to this cowgirl wisdom, and audience member suggested, "Buckle Bunny Wisdom." Starbuck said she wished she'd had some of that wisdom when she taught for thirty years. Although JoAnne Zeterberg was the last on the panel to be introduced, her story, "Death on the Intergalactic Seas," leads off the collection. It features a fantasy cruise, and an alien is found dead on the cruise ship. JoAnne reminded us that if you know a writer, everything is fodder for stories. She picked up her idea from a co-worker who attends fantasy fan conventions, and comes back talking about all the costumes. Zeterberg thought a fan convention would be a fun place to kill someone, since everyone was in costume. So that no one could escape, she set her story on a cruise ship. As moderator, Roni asked the panel if living in Arizona influenced their writing. Lori answered absolutely. She said boulders up by I-10 were used in the setting of her first novel, along with tunnels and caves. She likes to write about places she's familiar with. Judy Starbuck set her story in Prescott, a setting that reminds her of her midwestern upbringing, but the culture is not familiar. She's been inspired by the Spirit Ranch, where she's stayed with friends who own a ranch in Skull Valley, outside Prescott. She's used her friends' names, the cabin she stayed in, and the terrain. Prescott is even one of the places that claims to have the "World's Oldest Rodeo," although other places make the same claim. Howard Carron said he left the U.S. in 1969, and came back in '93, so most of his stories are set overseas. He likes to use settings and customs that people aren't familiar with. He likes playing with those settings. Olson put Deb Ledford on the spot, asking her the difference between writing a short story and a novel. Ledford answered "Time." Short stories are more encapsulated, and you have to tell a whole story, bringing if full circle. Novels can leave some elements open-ended, particularly if you want to write a series. There can be unanswered questions. Short stories should be complete, with compelling endings. Olson quoted another author, and member of Desert Sleuths, Kris Neri, as saying a short story is more about the destination, and a novel is more about the journey. Chantelle said she had never written short stories until last year's anthology. She said you needed to parse the story down to what the point is. Roni said she had written short stories, but last year was the first time she wrote a mystery short story. She saw it as an exercise in discipline. She found herself, with only between 2500 and 5000 words to write, telling a story, and then abruptly, and then he died. In a short story, the story has to be reined in. Osman agreed, saying like homework, a short story has to have parameters. There has to be some sort of mystery, and there's the arc of beginning, middle, and denouement. And, there are "So many places to write about, and people we want to kill." JoAnne also said last year's story was her first short story. She said you have to get characters readers care about, mystery and tension, all in 5000 words. But, the short story form is a good way to try new characters, and see if you want to expand the story or characters into a novel. Ledford agreed, saying she's writing a novel now with a lead character from a short story she wrote five years ago. The character never left her. Carron said everyone thinks librarians only read all day, but you're lucky if you ever get a chance to read. He never has much time to sit down and write for a straight period of time. Short stories are the perfect medium for him, forcing him to edit. Roni wanted to mention that Chantelle Osman and Deb Leford were the editors of How NOT to Survive a Vacation. She said that's a challenge because the stories always need another look. Nancy Redd also wanted to compliment the editors. She said just when she thinks she's distilled the story to its essence, they prove her wrong. They have wonderful suggestions. Judy Starbuck added that the formatting was first class, and she's proud to be a part of the anthology. Asked if it had been a blind submission process, Chantelle said yes. She said it's a small community of authors, and it's important to make sure they don't know who submitted the stories. She said just when you think you can guess who wrote a story, you're wrong. The stories have totally different voices. There is so much freedom to play with the parameters. They used Sue Flagg's story, "The Place I Was Before," as an example. Sue wasn't at this program, but she based her story on a song, "Hotel California." It's a three-page story, very different from what she normally writes, and very well done. Chantelle said a short story allows you to explore. Her story was unusual for her, silly, and a cozy. There are cozies, thrillers, and paranormal stories in this collection. They did ask the audience for suggestions as to topics for the next anthology. They've now used holidays and vacations. Roni said they should use "How Not to Survive a Trip to the Library." Someone mentioned April 15. Reunions were mentioned, with all the different types of reunions. Roni said authors are always asked, "Where do you get your ideas?" She said, that's why you write. You write because you have so many ideas. Everything is fodder for a story. Asked if friends recognize themselves, Olson told a story about the author Louise Penny. She said her friends are in her books, but none of the recognize themselves. Picking up on the theme that everything is fodder, Chantelle said she's just back from California,a nd she had been staying in an apartment there. Right across from the apartment were community dumpsters. And, every day, a well-dressed woman would go out to the dumpsters, go through them, and then get in her nice car and drive away. Osman is working on that short story now. In How NOT to Survive the Holidays, Judy Starbuck wrote about a woman running away from a stalker. That idea came from two sources. In Anne Tyler's Ladder of Years, she wrote about a woman who went on vacation with her demanding husband and three teens. One day, she went for a walk, and just kept walking. That story always stayed with Judy because she was the mother of three teens at one time. Then, she borrowed the movie, "Sleeping with the Enemy," about a woman who disappeared. Starbuck was envious. How do you do that? Things you read provide ideas. Now, Starbuck has a library of books on how to disappear. Deb Ledford said sometimes she bases stories on a CNN crawl, because you never know the details, or how a story ends. One audience member asked if the authors had always written. Howard drew laughter when he said he'd written so many educational papers, and so many of them were actually fiction. Most of the panelists had always written. Olson said, in her opinion, to write well, you must be honest and reveal yourself. That's what kept her from pursuing her writing for almost fifty years. Roni said she believes everyone is a writer. And, we must write because it's good to get that out of our heads and heart. Chantelle said mystery writers like to see justice done. There was laughter because she finished that by saying, "We're like superheroes." At one point, it was mentioned that Chantelle wrote flash fiction, so I asked her to tell us about that. She said those are stories under 1000 words. She said you can be given prompts. Here's your subject. Write about this; you have ten minutes. It could be rocks, or various items. Once, she was given lipstick, and knitting needles, so she wrote a piece, "The Case for Killing Granny." When a cop investigated the death of a woman killed with knitting needles, and asked the victim's sister who might have wanted to kill her, the sister said possibly members of the woman's knitting circle, because she was always stealing patterns. When the cop asked where to find them, the sister replied, "I guess now I'm the only one left." Osman has a piece in an anthology called, "A Cup of Joe." It's an anthology of a flash piece a day, with 365 stories. Flash fiction is a great way to get your name out. You're put on the clock and have to write. Going back to Chantelle's earlier comment about superheroes, Diana said, that's why Chantelle is wearing spandex, and is called "The Flash." Howard mentioned he had once taken a course from a behaviorist, who told them they had to be an inanimate object. He was told to be a rock. Or, you could be in the hot seat. There are two seats. You sit in one, and ask a question that has been bothering you. Then, you get up, go to the other chair, and answer it. Olson's last question was, why write mysteries, in times like now. Diana Manley said everyone is looking for order. They want to know that good triumphs. Judy Starbuck said she writes mysteries because it's fun. But, she also likes order. Chantelle agreed that it's fun, and she likes black humor. She also likes the patterns of mysteries. Mystery is ill-defined as a genre. It can be funny, or a thriller like James Bond, or involve cats. There's not even always a dead body. Lori said for her, it's an adventure and fascinating. And, I don't know which author summed it up. Why short stories? "They're short." Roni Olson, President of Desert Sleuths, said, "There's something to be said for that." 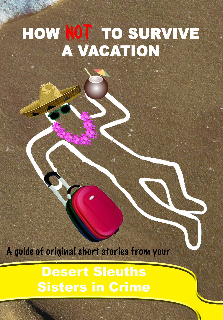 How Not to Survive a Vacation by Desert Sleuths Chapter of Sisters in Crime. DS Publishing, ©2010. ISBN 9780982877401 (paperback), 206p. Lesa, our talks at your library are always fun. You create such a warm inviting atmosphere. Thank you for such a thorough recap. Now we have a record of our good day with you. It's so much fun to have all of you at the library. I'm so glad I met you at Poisoned Pen, and all of this happened from that meeting. Wonderful review and it makes it even more fun to visit some of you at your meetings and get to know you better. Your author name is priceless, Velma Teaque. I have enjoyed each book and I hope you all write for years to come. Thank you, Anonymous. I hope you come back and read the review regularly. Thank you for having us, Lesa, and for this fabulous review! We always feel so welcome at the Teague. You're all so thoughtful to provide brilliant marketing, name tags and accessories, and we have so much fun! I can't think of when I've laughed so much doing a panel! Wasn't that a fun panel, Chantelle? Someone asked me about it today, since she couldn't make it on Saturday, and that's exactly what I told her. It was fun, and we all laughed a lot. Thank you for coming to the library. I'm so glad I met all of you!